Whether you’re looking for a fun family outing or wanting to flex your competitive muscle with friends, Belmont Park San Diego has tons of different activities for everyone. 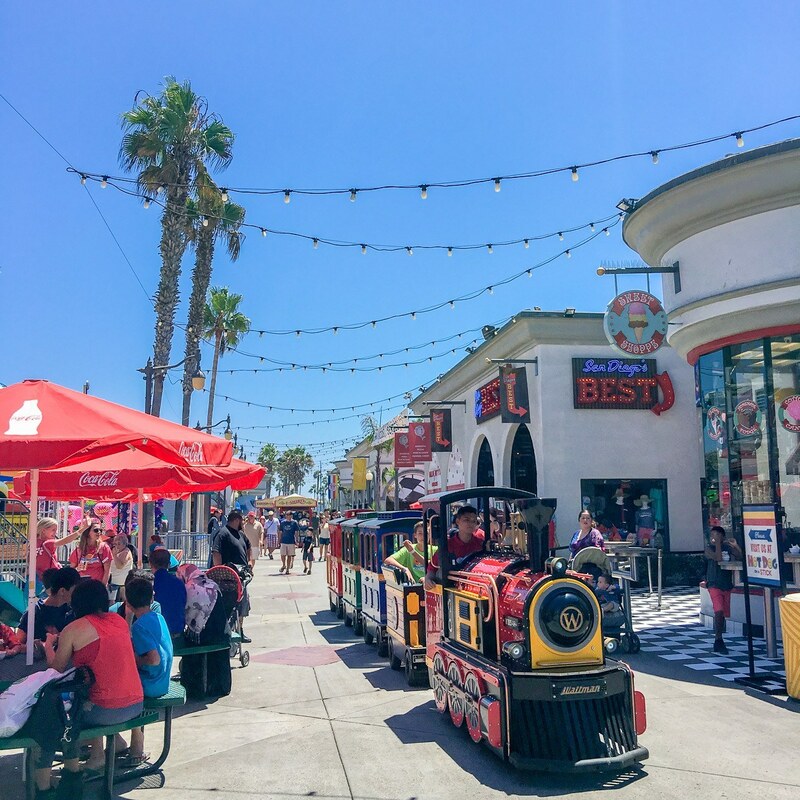 You’ll also discover great options to spend the afternoon or enough fun to dedicate an entire day to this seaside amusement park located in San Diego’s Mission Beach neighborhood. It’s important to think about how much time you’ll spend here and how many rides you or the kids will want to experience. A la carte ride tickets add up, but there are ways to save. 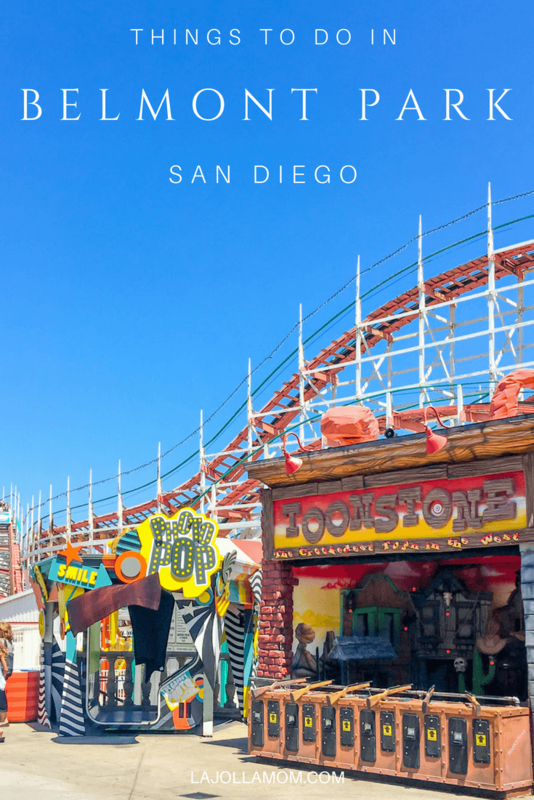 Built during the Golden Age of wooden roller coasters, the Giant Dipper Roller Coaster has been active since 1925 making it the second oldest coaster in the United States and a San Diego icon. The coaster overlooks the Pacific Ocean and is known for its abrupt turns and dips reaching speeds of up to 48 mph. Not for the fainthearted, riders should prepare for a thrilling, stomach-clenching drop of 75 feet. Minimum Height: Must be at least 50” to ride. Belmont Park is home to twelve different rides. A fixed interactive ride, Control Freak gives you all the power by letting you choose which direction you’ll flip the entire ride (clockwise or counterclockwise). You and your partner will share control of the ride via buttons located on your shoulder restraints. The control switches from one person to the other after a pre-determined amount of time has passed. A loud sound signals the switch of power, so beware! Suspended in inward facing cars on inverted seats that form a giant circle, the Beach Blaster is a daring, swirling, frenzied ride of thrilling mayhem. Continually spinning, the ride also swings with irregular occurring G-forces that reach heights of up to 67 feet traveling 120 degrees in both directions. This organized chaos will keep you guessing and have your adrenaline pumping. Minimum Height: Must be at least 48.” There are no exceptions. Set on a track similar to a roller coaster, the Octotron is a thrill ride that spins you around while you use a joystick to spin yourself either forward or backward. Since you control the ride, you can get as dizzy as you want. Spin non-stop or not at all, the choice is yours. At night, neon lights give it a vibrant glow. Minimum Height: Must be at least 48” to ride. There are no exceptions. A classic amusement park staple, the Tilt-a-Whirl is a spinning good time that is sure to get you dizzy, and have you giggling by the time the ride ends. This is a great family ride choice. Minimum Height: 48” to ride alone; under 48” must be with another rider who meets the minimum height requirement and is at least 8 years old. A Spring Ride, the Vertical Plunge is a stomach-dropping ride that rises three-stories before plunging back down to the ground. Each ride is on a two-minute cycle where you rise and drop and then repeat. It’s an exciting time for the whole family. Minimum Height: 42” to ride alone and at least 36” to ride with a person at least 42” and at least 8-years-old. A mini-submarine replica, Crazy Submarine features two big mechanical arms that rotate this ride both clockwise and counterclockwise in the air. It reaches a maximum speed of 10 rpm, and a maximum height of 20 feet making it a big thrill for your little ones. Minimum Height: Must be at least 42” to ride alone, or ride with another rider who meets the minimum height requirement and is at least 8 years old. A day at the park isn’t complete without a ride on the Liberty Carousel. This antique replica takes you back to the Golden Age of Carousels with its 12 paintings depicting San Diego’s storied history. Located near the Giant Dipper, enjoy whirling around this 30-foot-wide carousel boasting 800 twinkling lights as it plays classic tunes. Minimum Height: No height requirement, ages two and younger must be with a rider who is at least 8-years-old. Providing the thrill of a larger ride while remaining little kid-friendly, the Speedway is a NASCAR-inspired, two-seater, whip-style ride featuring sharp turns as it circles a glittering oval-shaped track. Minimum Height: Must be at least 36” tall, or ride with another rider who meets the minimum height requirement and is at least 8 years old. Hop aboard the Belmont Express. This mini-express train has all the bells and whistles of a real train, including a smokestack that shoots fog into the air as it travels down the midway and along the park’s perimeter. It’s an exciting ride for any little one who is obsessed with Thomas the Tank Engine. Minimum Height: Must be at least 36” to ride alone, or ride with another rider who meets the minimum height requirement and is at least 8 years old. A classic bumper car experience, Overdrive Bumper Cars let you chase and bump your opponents around the 2,000-square-foot driving floor in one of their 14 vibrant multicolored cars. Minimum Height: Must be at least 50” to ride alone, or ride with another rider who meets the minimum height requirement and is at least 8 years old. A twist on the classic bumper car experience, Krazy Kars are inner tube shaped bumper cars that add a spinning element as you chase and bump into your fellow car drivers across the 1,400-square-foot driving floor. It’s an especially cool experience at night. You’ll cruise around in one of their 13 multicolored cars while listening to some groovy tunes, as black lights and a disco ball create a 1970s vibe that’ll have you feeling electric. Want to reach a new vantage point? You’re in luck! Belmont Park gives you three different options to ascend new heights, Sky Climb, Coconut Climb, and Sky Ropes. First, you can move step-by-step while rock climbing at Sky Climb. With countless routes to master the mountain, you’ll experience the adrenaline of a mountaineer trying to find the best hand and foot holds. 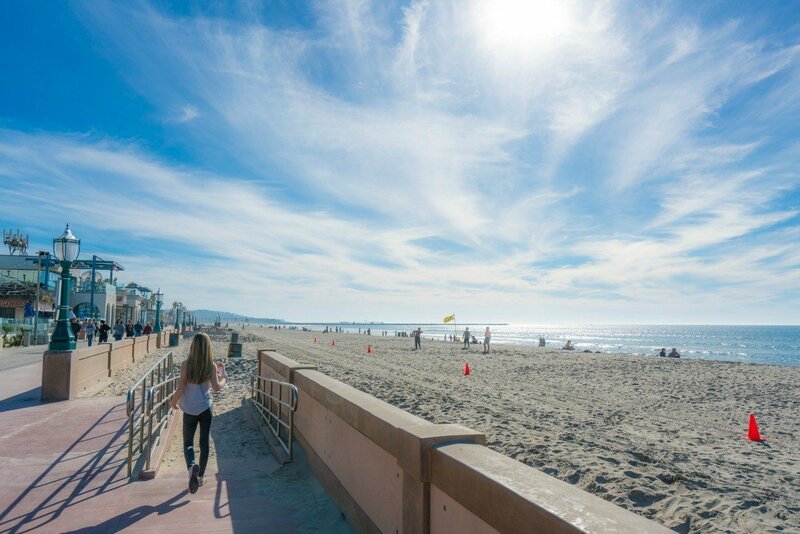 Once you reach the top, you’ll be rewarded with sweeping views of Belmont Park and the Pacific Ocean. Restrictions: Climbers must fit into safety harnesses and weigh between 50 and 250 pounds. A unique twist on rock climbing, the Coconut Climb is a tropics-inspired activity that brings out a little friendly competition among friends, or perhaps strangers. After you get harnessed in, you and an opponent will race to the top of your palm trees to be the first one to ring the victory bell. If you’re looking for the same adrenaline rush as the Coconut Climb and Sky Climb, but want a little more diversity, head over to Sky Ropes. This two-story activity features 26 challenging elements including a zip line. You’ll traverse balance beams, cross tightropes, navigate stairs, and take on other formidable tasks. Restrictions: Must be 48” to climb alone. People under 48” but above 36” can climb with another climber who meets the height requirement and is at least 18 years old. The maximum height is 6’ 7,” and the maximum weight is 300 pounds. Soar through the Adrenaline Zone of Belmont Park on a zip line. One of the newest additions to the park, you’ll fly through the sky from the Zip Line Tower to the arcade reaching top speeds of 15 mph. Each person gets two zips per admission fee. Restrictions: Must be at least 46” and weigh between 50 and 250 pounds. 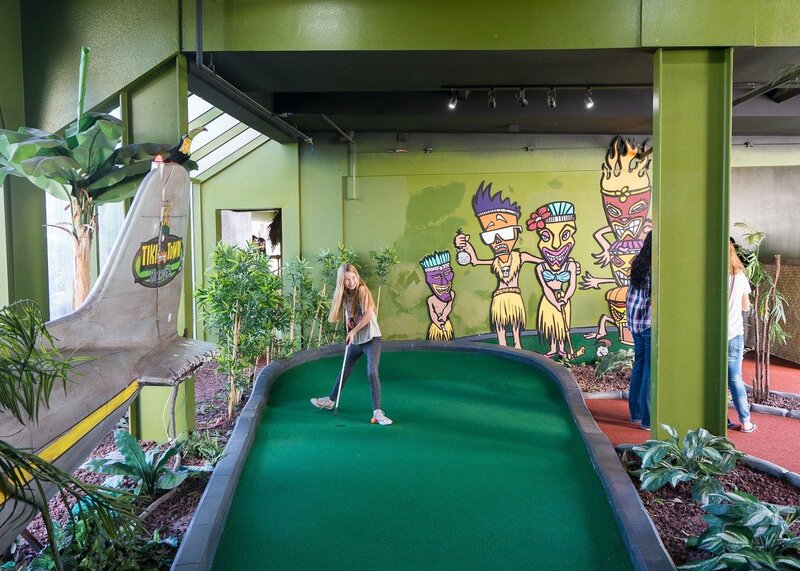 Things get interesting as you enter the Tiki Town Adventure Golf Course. Great for all ages, this course keeps everyone on their game with twists, turns, and surprises. To get started, choose a putter and a colored golf ball, then you’re ready to take on the 18-hole mini golf course doing your best to beat par. Even better, get a hole-in-one on hole 18, and you’ll win a free $5 power card to use at the arcade. For a taste of classic gaming with a modern twist, bring the whole family to the LaZerBlast Arcade. Here you can switch between old favorites like Pac-Man and trying your hand at the newer games like Dance Dance Revolution. You can also earn tickets to redeem for various prizes. There is no need for change as the arcade runs on a reloadable card system. 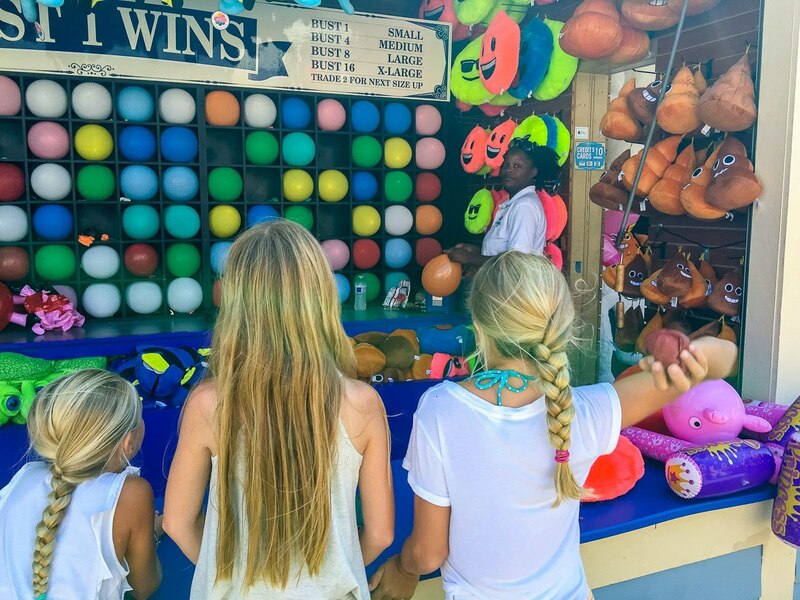 Try your best to win a stuffed emoji and other fun prizes by playing a variety of carnival-style games at the Belmont Park Midway. While they change periodically, you’ll currently find games like a high striker that will test your strength, a tub toss game that challenges your dexterity, and a balloon busting game that has you working on your aim, among others. The better you are, the bigger and better the prize you’ll win. Team players with good aim and a penchant for strategy will love an invigorating game of laser tag at LaZerBlast Arcade. Hiding around corners and seeking out your opponents on this three-level Tron-themed course make laser tag a great activity for all ages. There are two bases, as well as a third neutral base. They can be used to gain your team extra points, just point and shoot. You can also “deactivate” your opponents for a few precious seconds when you connect with their vests, but be warned; they’ll most likely come back with a vengeance. The arena is located in the same space as the arcade, giving you free rein to move between gaming and laser fun. Restrictions: Laser Tag vest must fit each participant comfortably to participate. Price: $8 per person per game or $20 for unlimited games. Will you accept the challenge of the Lazer Maze? This Mission Impossible-style maze is set up in a small room that is crisscrossed with several lasers. Your goal is to get through the maze as fast as you can. Each beam you hit will add time to your score. Lazer Maze offers you the choice of two modes – classic Lazer Maze where you dodge beams or Beam Buster where you try and hit as many beams as you can in the allotted time. No, I’m not talking about the park. I’m talking about the new escape room, Escapology. Put your best sleuthing hat on because you and the gang have one hour to crack the code, pick the locks, and figure out how to escape from this epic puzzle room. Choose from three room options – Antidote, Budapest Express, and COD3, or go through all three to keep you on your mental game. Note: Check the Belmont Park website to find out the days and times this attraction is open. Restrictions: Escapology is not recommended for kids under seven. All players under 18 must have a parent/guardian sign a waiver for them to play. Price: $40 per person for two players. $35 per person for between three and six players. Take a step back in time in the Tiki Town Jungle at Jungle Gems – a mining and sluicing company. Here, you and your little ones will receive a bag of dirt (you choose the size). You’ll dump the contents and sluice through the water to uncover amazing discoveries like fossils, gems, stones, and even arrowheads and shark teeth from time to time. Try your hand at combat in this immersive movie experience. The Xanadu 7D Theater puts you smack-dab in the movie action at this state-of-the-art theater featuring motion seats and incredible digital effects. You’ll be provided with a blaster gun to shoot down your enemies as your seats move you through the movie. You’ll choose from three themed movies, including Pirates, Zombies, and Aliens. The person who connects with the most opponents by the end of the movie wins the game. Restrictions: All riders must be at least 40” tall (no exceptions) and weigh no more than 350 pounds. Belmont Park features 11 carnival-style food stands that serve up everything from tacos to funnel cakes, ensuring your appetite is fully satiated by the end of the day. Here’s a quick breakdown of everything they have. 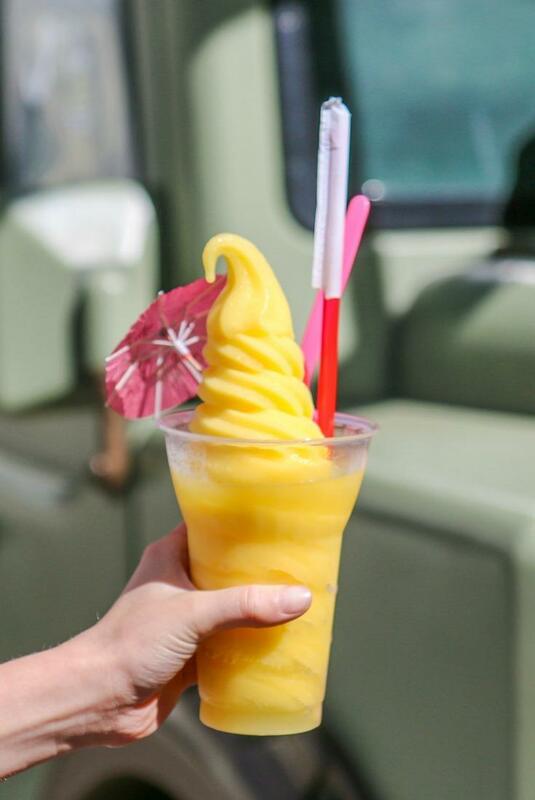 A cult classic made famous by Disney™ amusement parks, Dole Whips are a tasty tropical treat you won’t want to miss, especially on a hot summer day. Another great spot for a refreshing treat, The Sweet Shoppe features yummy delights like frozen bananas and Monster Waffle Cones. Don’t forget to try their homemade fudge! This one is for nostalgia buffs. You’ll find shaved ice, soft serve ice cream, waffle cones, and other classic ice cream shop delights here. Get their world-famous whole-wheat float-fried pastry topped with your choice of delicious toppings like Oreo’s, Heath, Reese’s, and Apple Cinnamon. 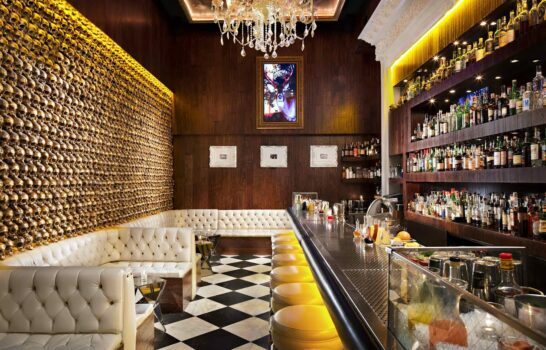 They also serve soft-serve ice cream, coffee, smoothies, and other beverages. A classic, carnival-style staple, enjoy a banana split with a little polka dot twist. Grab a high-end Italian coffee to sip as you stroll around the park. Get your grab-and-go tacos right on the boardwalk side of Belmont Park at popular El Jefes Taco Shop, serving up everything from fabulous fish tacos to refreshing Mexican fruit cups with Tajin. Just like its name implies, get your hot-dog-on-a-stick, and pair it with their delicious hand-stomped lemonade. Choose from a wide selection of dogs including turkey, beef, and veggie. They also serve fries and funnel cakes on a stick. Get classic American fare fast at Belmonty’s, offering a wide selection of burgers, sandwiches, pizzas, and the traditional funnel cake. Enjoy concession-style snacks such as freshly made pretzels, Tio Pepe churros, chips, cotton candy, cola classics, and flavored ICEE’s. A convenience store, the Snack Shack has all your beach essentials from sunblock and cheap boogie boards to bottled water and standard snacks like Snickers and Skittles. While there are several places to eat at Belmont Park, Draft is among the most popular for its ocean views and extensive list of nearly 100 beers – 69 draft brews and 30+ bottled options. This is only elevated by their hand-crafted fare that includes tantalizing choices like their Ahi Salad or their Salmon Burger. This beachside restaurant is the perfect place to decompress after a day at the park. Want to drink on the beach? The Beach House restaurant on the Boardwalk is as close as it gets in this part of town. With toes in the restaurant’s sand, sip cocktails and enjoy burgers and salads with friends. Larger groups can rent one of the cabanas. Cannonball boasts the largest beachfront outdoor patio in San Diego and a pretty good Pacific Rim menu to accompany the views. Forget your swimsuit or need a souvenir? 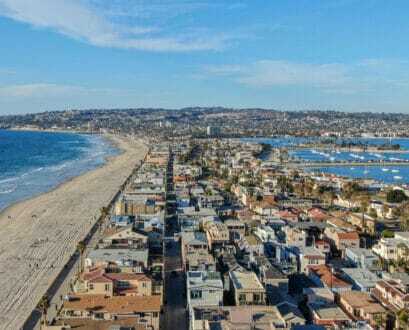 Between Sun Diego, Wings, San Diego Trading Company and other shops, Belmont Park has your beachy retail needs covered. 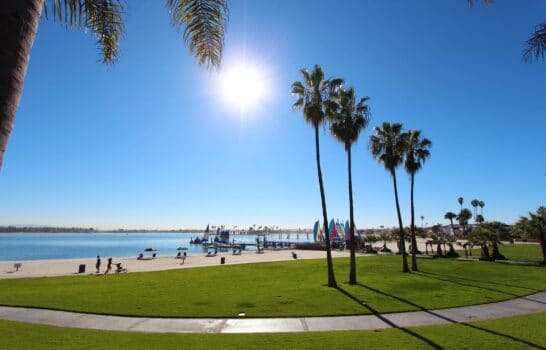 While not technically located within Belmont Park, once you’re done exploring all the adventures inside, you would be remiss if you didn’t finish your day enjoying the stunning sunset at Mission Beach or meandering down the boardwalk. It’s barely even a hop, skip, and a jump from the park entrance and a perfect place to enjoy one of the treats mentioned above. After all, with all that running and racing you did in the laser tag arena, you’ve more than earned it. You can also grab a bike, board or beach chair at Mission Beach Rentals @Belmont. Admission to Belmont Park is free, but you’ll need to spend a little cash on rides and activities to enjoy it. You can pay at Belmont Park to enjoy a la carte rides and attractions, but it is much more economical to purchase bundled tickets. There are two options. There are several ways to save money at Belmont Park if you can plan ahead. Groupon usually has a Belmont Park offer. At the time of this writing, it is pay $19 for a One-Day Unlimited ride pass. 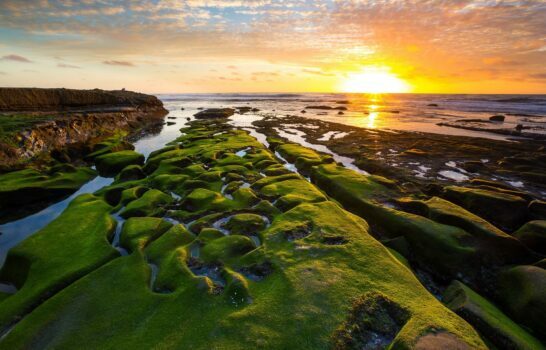 If you are visiting San Diego, it is wise to consider the Go San Diego Card. 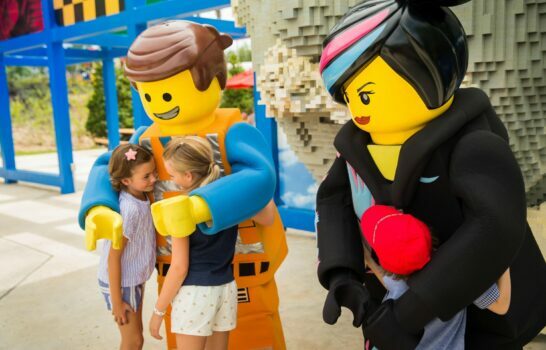 This bundled attractions pass includes the likes of the San Diego Zoo, LEGOLAND California, and San Diego theme parks and attractions. The Go San Diego Card All-Inclusive and Build-Your-Own options include the Ride & Play Belmont Park pass good for rides and attractions. Looking for just for unlimited rides? Find the Ride Pass at a discount at aRes Travel. 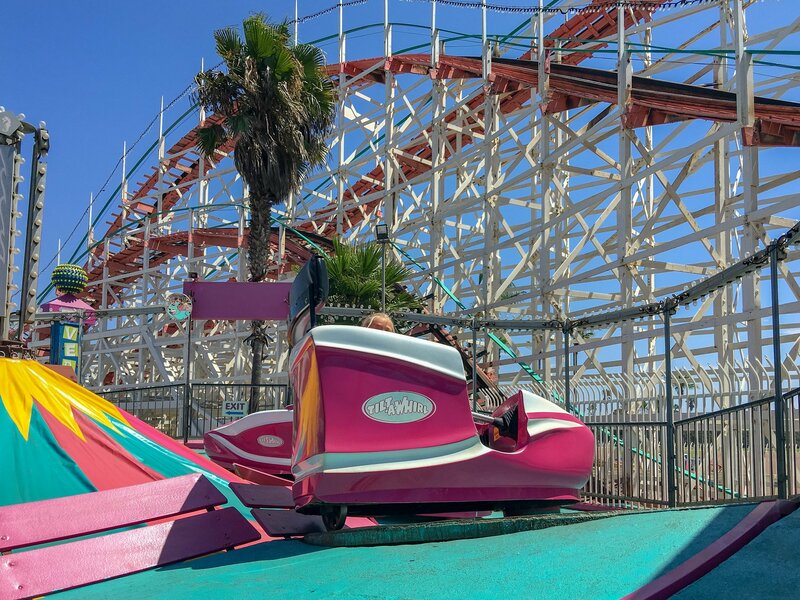 San Diego residents who frequent the park should consider the new Belmont Park annual pass, which provides unlimited rides and attractions at $89 for juniors and $99 for adults. There are four, free public parking lots surrounding Belmont Park. They do tend to fill up during the weekends and summer so arrive early during peak season. It is always wise to check the Belmont Park calendar before you go to make sure the rides and activities are open. During winter, for example, the rides are not open daily. What is your favorite activity at Belmont Park?